Advice was freely given long before I set a date to begin hitch hiking. The words of discouragement ramped up as the date came due. You might think the advice was centered on the dangers of unscrupulous motorists, but this was 1968. More than half the advice I heard was to watch out for cops. Cops don’t like hitch hikers. Hitch hikers have no money and nothing to offer and it is the cop’s job to be mean so they keep moving on. Being young and not in the military I’d be a hippie for sure and the cops would just as soon beat up a hippie as go to their kid’s little league game. With such concerns I set off from Twentynine Palms, California, where I’d fallen in with a military widow. 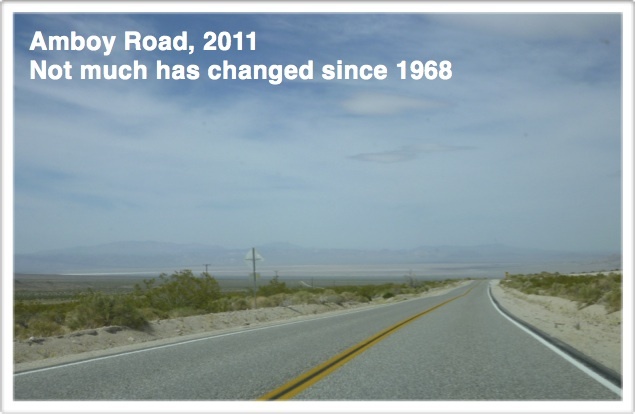 Barbara insisted on driving me to U S Highway 95 and I was glad for the ride over long, straight, and mostly deserted Amboy Road and then old Highway 66. In those 101 miles we may have passed five cars. Today Highway 66 is Interstate 40 and I’m thinking the sound of tires on pavement is pretty prevalent where U S 95 takes off to the north. But a few days before Christmas in 1968 it was a sandy spot in the desert with two small paved roads, one running east and west and the other taking off to the north. And that was it. Barbara’s Cadillac grew smaller on the horizon. The wind blew. Barbara’s car had been out of sight for some ten minutes before an older gray sedan approached from the east. Low and behold, it slowed and turned north. My Boise for Xmas sign was in the air. I got my very first ride. Within five minutes the rather rumpled driver had told me he was a cop. It was the only time I’ve been in a car while looking forward to being pulled over, but I didn’t get a chance to watch this guy in action. We pulling into the south side of Las Vegas with nary a slow-down. As we approached the city he said he had to stop at the local office and report. He apologized, “there are rules about not picking up hitch hikers on duty, so I have to let you out.” I thanked him for the ride and the great chat. And that, my friends, was my first run in with a big bad cop. It got me 95 miles and some stories about how easy it is to overlook absent windshield wipers. The day would not end before my second run in, this time with two big bad coppers. This entry was posted in Hitchhiking and tagged 29 Palms, Amboy, cops, federal agent, first ride, Highway 95, Las Vegas, police, Route 66 on August 21, 2013 by deansgreatwahoo. Cool story Dean. Seem like that guy had too much time on his hands. Well dang it. I thought I had subscribed, but apparently not. Now I think I have. And I already tried to comment once on this fun post but it flew away into the thither. Anyway, I loved the fun twist this took, and the lines: Barbara’s Cadillac grew smaller on the horizon. The wind blew.